NOT FOR USE IN NEONATES. The following preparation is designed solely for parenteral use only after addition of drugs that require dilution or must be dissolved in an aqueous vehicle prior to injection. 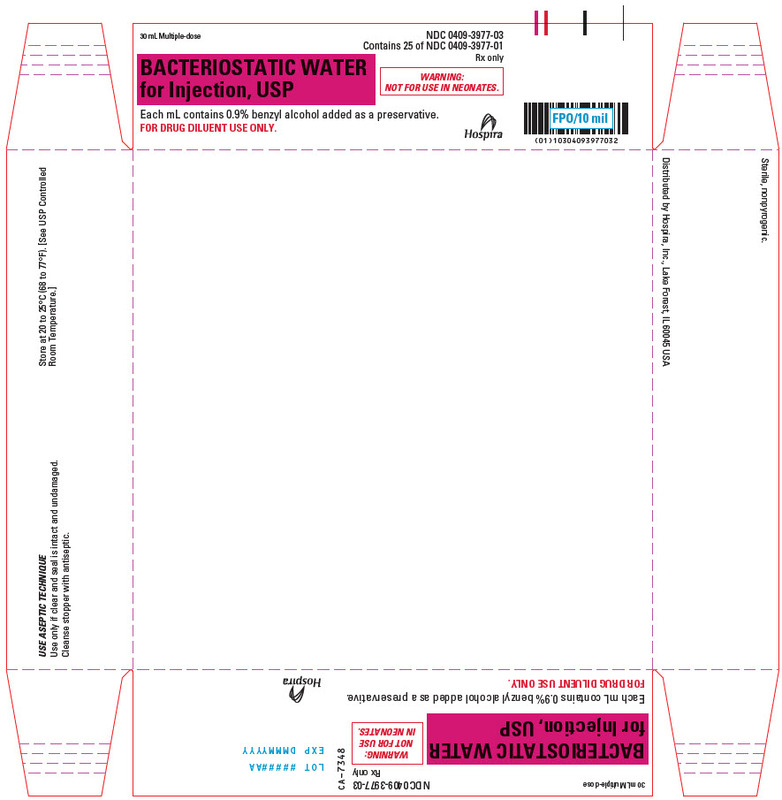 Bacteriostatic Water for Injection, USP is a sterile, nonpyrogenic preparation of water for injection containing 0.9% (9 mg/mL) of benzyl alcohol added as a bacteriostatic preservative. It is supplied in a multiple-dose container from which repeated withdrawals may be made to dilute or dissolve drugs for injection. The pH is 5.7 (4.5 to 7.0). Water for Injection, USP is chemically designated H2O. The semi-rigid vial is fabricated from a specially formulated polyolefin. It is a copolymer of ethylene and propylene. The safety of the plastic has been confirmed by tests in animals according to USP biological standards for plastic containers. The container requires no vapor barrier to maintain the proper labeled volume. Water is an essential constituent of all body tissues and accounts for approximately 70% of total body weight. Average normal adult daily requirement ranges from two to three liters (1.0 to 1.5 liters each for insensible water loss by perspiration and urine production). Water balance is maintained by various regulatory mechanisms. Water distribution depends primarily on the concentration of electrolytes in the body compartments and sodium (Na+) plays a major role in maintaining physiologic equilibrium. The small volume of fluid provided by Bacteriostatic Water for Injection, USP when used only as a pharmaceutic aid for diluting or dissolving drugs for parenteral injection, is unlikely to exert a significant effect on fluid balance except possibly in very small infants. This parenteral preparation is indicated only for diluting or dissolving drugs for intravenous, intramuscular or subcutaneous injection, according to instructions of the manufacturer of the drug to be administered. Due to the potential toxicity of benzyl alcohol in neonates, solutions containing benzyl alcohol must not be used in this patient population. Parenteral preparations with benzyl alcohol should not be used for fluid replacement. Parenteral preparations containing benzyl alcohol should not be used in epidural or spinal anesthesia procedures. Bacteriostatic Water for Injection, USP must be made approximately isotonic prior to use. Benzyl alcohol, a preservative in Bacteriostatic Water for Injection, USP has been associated with toxicity in neonates. Data are unavailable on the toxicity of other preservatives in this age group. Where water is required for preparing or diluting medications for use in neonates, only preservative-free Sterile Water for Injection should be used. Intravenous administration of Bacteriostatic Water for Injection without a solute may result in hemolysis. Do not use Bacteriostatic Water for Injection, USP for intravenous injection unless the osmolar concentration of additives results in an approximate isotonic admixture. Consult the manufacturer's instructions for choice of vehicle, appropriate dilution or volume for dissolving the drugs to be injected, including the route and rate of injection. Inspect reconstituted (diluted or dissolved) drugs for clarity (if soluble) and freedom from unexpected precipitation or discoloration prior to administration. Pregnancy: Animal reproduction studies have not been conducted with Bacteriostatic Water for Injection. It is also not known whether Bacteriostatic Water for Injection containing additives can cause fetal harm when administered to a pregnant woman or can affect reproduction capacity. Bacteriostatic Water for Injection, USP containing additives should be given to a pregnant woman only if clearly needed. The safety and effectiveness of Bacteriostatic Water for Injection, USP have not been established in pediatric patients. Due to the potential for toxicity, solutions containing benzyl alcohol should not be used in neonates. Some drugs for injection may be incompatible in a given vehicle, or when combined in the same vehicle or in a vehicle containing benzyl alcohol. Consult with pharmacist, if available. Use aseptic technique for single or multiple entry and withdrawal from all containers. When diluting or dissolving drugs, mix thoroughly and use promptly. Do not store reconstituted solutions of drugs for injection unless otherwise directed by the manufacturer of the solute. Do not use unless the solution is clear and seal intact. Reactions which may occur because of this solution, added drugs or the technique of reconstitution or administration include febrile response, local tenderness, abscess, tissue necrosis or infection at the site of injection, venous thrombosis or phlebitis extending from the site of injection and extravasation. If an adverse reaction does occur, discontinue the infusion, evaluate the patient, institute appropriate countermeasures, and if possible, retrieve and save the remainder of the unused vehicle for examination. Although adverse reactions to intravenous, intramuscular or subcutaneous injection of 0.9% benzyl alcohol are not known to occur in man, experimental studies of small volume parenteral preparations containing 0.9% benzyl alcohol in several species of animals have indicated that an estimated intravenous dose up to 30 mL may be safely given to an adult without toxic effects. Administration of an estimated 9 mL to a 6 kg infant or neonate is potentially capable of producing blood pressure changes. Use only as a diluent or solvent. This parenteral preparation is unlikely to pose a threat of fluid overload except possibly in very small infants. In the event these should occur, re-evaluate the patient and institute appropriate corrective measures. See WARNINGS, PRECAUTIONS and ADVERSE REACTIONS. The volume of the preparation to be used for diluting or dissolving any drug for injection is dependent on the vehicle concentration, dose and route of administration as recommended by the manufacturer. Parenteral drug products should be inspected visually for particulate matter and discoloration prior to administration, whenever solution and container permit. See PRECAUTIONS.